All Quotations, Orders or Contracts are subject to the following conditions of sale. 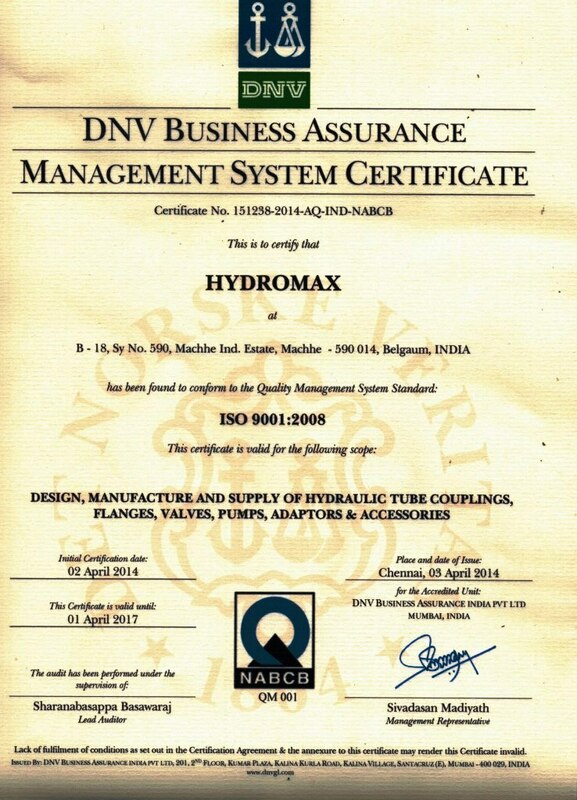 Any Qualifications for these conditions made by the purchaser will not apply unless expressly accepted in writing by HYDROMAX (hereinafter called the COMPANY). Prices are Ex-Works. (Excluding Taxes, Packing & Forwarding [Handling Charges])and are in INDIAN CURRENCY. Orders in writing, e-mail or fax are preferred. Verbal orders are also accepted, except for NON-STANDARD products purchase order is a must, otherwise the same will not be taken for process. Upon receipt of our Order Acceptance by e-mail / Fax / Post / Courier, kindly check the same and inform us in writing, if there are any discrepancies. If no reply is received within 2 days, the material will be despatched as per our Order Acceptance. All additional requirements will be treated as fresh orders. Profroma invoice will be email or will be courier to you. You can deposit your Cheques/DD along with paying slip at BANK OF INDIA IN YOUR CITY. The Cheques/DD will be locally cleared and amount will be credited to our account. Your account at HYDROMAX will be credited only after our Bank account is credited. This procedure is available for only local clearing i.e. there should be an BANK OF INDIA operating in your city. If you have an account in Same Banks the Cheques/DD will be credited to our account on same day. CASH upto Rs 1,00,000 can be deposited in any Bank. Above Rs 1,00,000 PAN is required. You fax us a copy of the Bank Acknowledgement. All fittings except those mentioned in the price-list will be considered as non standard fittings.minimum batch qty for such fittings should be 25 no’s and above. discount for such fittings will be GIVEN ALONG WITH THE QUOTATION WITH PAYMENT TERMS AND DELIVERY PERIOD DIFFERENT. Charges will be calculated on Net Discounted Value. Standard Items will be delivered immediately if present in ex-stock otherwise delivery schedule will be given for same depending upon size and quantity. Vat, Sales tax, Excise Duty and any other taxes are extra as applicable at the time of dispatch, any increase in levies will be to purchaser’s account. Company’s responsibility ceases on handing over the material to the transporter. The company accepts no responsibility for loss or damage of material in transit. Company shall not be responsible for failure or delay in delivering the material or any part (or any consequential damages) due to acts of god, enemies of the Government of India, wars, revolution, riots, civil or political disturbance, strikes, lockouts, stoppage of raw material and /or labour shortage of motive power breakdown of machinery, restraint imposed on the company by government, municipality, legislature or any other authority or any other cause beyond the company’s control. such failure/delay shall not entitle the purchasers to cancel the contract nor is the company liable to make good any damage arising from such failure to deliver or delay in delivery. All quotations given and material sold are subject to the conditions that the company’s liabilities are limited to the replacement of material proved to have defective in material and / or workmanship, when they are sent back to the company. Any claim for replacement under this clause will arise only if the material is returned to the company within 12 months from date of supply. Company will not be responsible for any effect in the failure of material supplied which have been subjected to improper use and/or any process or processes after leaving the company’s premises. Company also accepts no responsibility for any contingent or resulting liabilities or loss arising through any defective material supplied. Company’s decision on the cause for any such defects is final and binding. Company reserves the right to refuse cancellation once an order has been accepted. Failure on the part of the Purchaser to accept delivery and make payments will be considered a breach of contract and the Company shall be entitled to cancel the contract and forfeit the deposit paid by the Purchaser, if any. Company also reserves the right to cancel any order and refund the money received if it is not in a position to supply the product. All disputes are subject to Belgaum District, Karnataka State, (India) Jurisdiction Only. 100% Advance with Purchase order by RTGS/NEFT transfer and the charges for the same to be borne by customer. In this case, HYDROMAX shall provide the total amount that has to be sent by the customer. This shall include Basic Material Value + 5% Handing Charges + Custom Clearance & freight Charges. Customer’s account number with Courier agency. In this case, customer can calculate the amount to be sent to HYDROMAX (include Basic Material Value + 5% Handing Charges) and sent the transfer amount. The courier shall collect the Custom Clearance & freight Charges from the customer. All other terms and conditions are same. Assuring you of our best services and soliciting your co-operation.